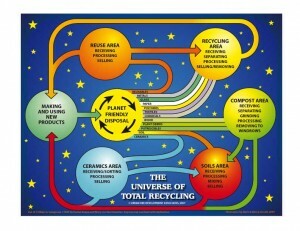 Chart showing the Universe of Total Recycling. Designed by Mark and Nancy Gorrell. I love the poster. Can I buy one? I am in Indiana. Hello Scott! Glad you like the design. Let me look into your request! Oh wow, I can’t belveie all these pieces were created with zero-waste. What an imagination the designers must have. Props for heading down that direction with your design. Being environmentally responsible is becoming increasingly important! I love this cnepoct, so respectful in a way. Thank you so much for sharing! I am also very interested in design, and dream of starting my own business some day. I sew or rework all of my own clothes, and I am always saving my scraps of fabric, because they always find a home in one of my designs. No waist. Love it! I shared your post on twitter. whoah this wbloeg is excellent i really like reading your posts. Keep up the good paintings! You realize, many people are searching around for this information, you can aid them greatly.